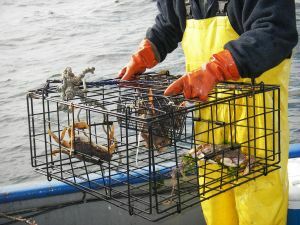 Several crab gear methods are employed in the sport fishery, depending on local conditions. Listed below are several types. Local fisherman and shops are happy to sell you pots, nets and buoys. Some may even rent pots or nets. They can tell you what bait to use and where the best location is to catch the crab. This makes for a great family outing while enjoying the beach. See Statewide Gear Rules for crabbing. The most commonly used crab gear to catch Dungeness crab. Sport fishermen can purchase, or create, pots that are constructed by wrapping netting or wire mesh over an iron frame in which one or two funnel-shaped openings, called tunnels, are left for the entry of crabs. Rapid exit from the pot via the tunnel is prevented by a 'trigger' device. 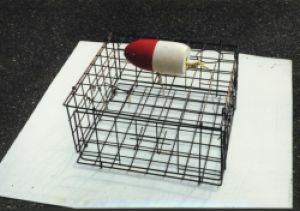 Two escape rings 4¼-inches in inside diameter are required on all crab pots having tunnel triggers. (3) a pot lid or one pot side (serving as a pot lid) secured by no more than three single loops of cord. Cord used must be untreated 100% cotton or other natural fiber no larger than thread size 120 or 1/8-inch. This cord, when attached as described above, will rot away and allow crab to escape freely if the pot is lost. Light-weight pots are satisfactory in most areas of Puget Sound, but strong tidal currents and wave action may necessitate heavier pots in some places. Commercial crab pots for the ocean weigh 75-150 pounds and are not well suited to sport use. Crab pots are generally set in water 20-150 feet deep (must be placed below the lowest tide line) and located by the line buoy. Sport crabbers must attach red and white marker buoys to their crab gear. These must be legibly and permanently marked with the operator's first name, last name, and address (telephone number is voluntary). Only one name and address may appear on a buoy. 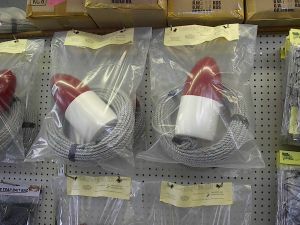 Buoy lines must be weighted sufficiently to prevent them from floating on the surface. Buoys must be visible on the surface at all times except during extreme tidal conditions. Crab pots may not be tended from a vessel at night (one hour after sunset to one hour before sunrise). Sport pots are generally baited with herring, rockfish carcasses, salmon heads, or clams. Efforts have been made to develop and test artificial baits, but they have not found extensive use. 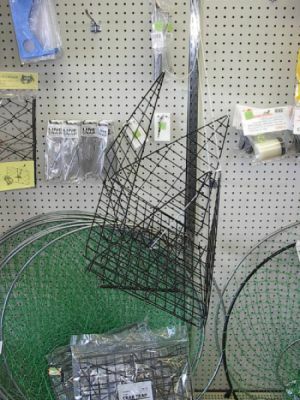 The crab ring net is basically a basket made from two iron hoops and cotton or nylon mesh. The upper iron ring is the larger in diameter. When lowered to the bottom, both rings lie flat to permit crabs quick access to the bait that is tied to the bottom meshes. When the ring net is subsequently hauled rapidly to the surface it forms a basket in which the crabs are momentarily trapped. These nets are tended frequently - perhaps every 15-30 minutes. In earlier days of the crab fishery, ring nets were an important commercial type of crab gear. In addition to boating use, ring nets can be efficient from numerous docks, piers, and jetties throughout the state. When calm weather corresponds with low tides this can be a productive method in some areas of the state. It involves slowly cruising over sand flats and eelgrass beds where crabs are found and dipping them with a wire and frame scoop attached to a long pole. This can involve a very sporty chase and is a method used in areas such as Lummi Bay, Padilla Bay, Camano and Whidbey Islands, and Port Susan. Perhaps the most popular site for this type of crabbing is Port Gardner off the Everett jetty where >200 crabbers have been counted in boats during a single low tide late in May. This method involves wading through lagoons or in shallow water at low tide and searching for legal-size crab. This method is most effective in eelgrass beds. While using this capture method, the wader generally tows a small tub or gunny sack to hold their catch so that both hands will be free to use the dip net. This method is frequently employed in parts of Puget Sound, including the Dungeness and Birch Bay areas, and along ocean beaches. This is not a common method for taking Dungeness crab, however, crab are occasionally taken incidentally along beaches and jetties when they are attracted to the bait and become hooked or tangled in the line. A variation of this method that intentionally targets crab is to bait and weight a 'bird's nest' of monofilament line and to cast this tangle with rod and reel.